Browse Artists and Groups G. Horne Russell, R.C.A. George Horne Russell was born in Banff, Scotland in 1861 - son of George and Susan (Conn) Russell. He made an early career choice and began to study art at a local school. His talent quickly developed and he was sent to the more advanced Aberdeen Art School, where again his progress outpaced the teaching. He moved to London and became a pupil at the celebrated South Kensington Art School, studying under Prof. Legros and Sir George Reid. He was what might be called a "sound" pupil and with native Scottish tenacity acquired a thorough grounding in the technique of his profession. He developed a decided flair for portrait painting and was encouraged to concentrate on that branch of his art. Russell executed a few local commissions, but was advised by a friend to move to Canada and "grow up with the country." Accordingly in 1889, at the age of twenty-eight, Russell arrived in Montreal, rented a studio, and established himself as a portrait painter. Among his numerous pictures were the portraits of Sir Alexander Lacoste, Dean Goodwin, Dr. Barbour, Sir Wilfrid Laurier and Lord Strathcona. His circle of sitters grew wider year by year, but Russell was not content to be exclusively a portrait painter. He had a profound love for the country, and more particularly the sea, which made a constant and irrepressible call to his brush. Happily, in 1909, the Grand Trunk Railway made him an offer to paint the Rockies and the Skeena River district of British Columbia. Russell gladly accepted, spent several months in the Rockies, and, on his return, painted some large and impressive canvases of these "unpaintable mountains," several of which (including the great Mount Robson) were sent to the International Exposition at Brussels. A series of canvases of great size and boldness were the result of the Skeena expedition, the well-known Mount Kitselas and Snowshoe Mountain being considered the finest landscapes of their type that had ever been painted in Canada. Russell always looked upon this western experience as of great importance in his development as a landscape painter. The large size of the canvases demanded a breadth of execution, a simplification of detail and the development of a color-scheme that could be carried across a broad space. While these canvases were frankly commissioned as "portraits of the Rockies," they are by no means uninspired transcriptions of the scene but reveal the vision of an artist who was tremendously impressed by what he saw, and succeeded in transmitting that feeling to the beholder. He went west as an illustrator, but returned as an artist. It seems to the writer that no artist in Canada had a more ideal life than Horne Russell. Portrait commissions came to him in an endless succession, making him independently secure from the usual hazards of the landscape painter's life. 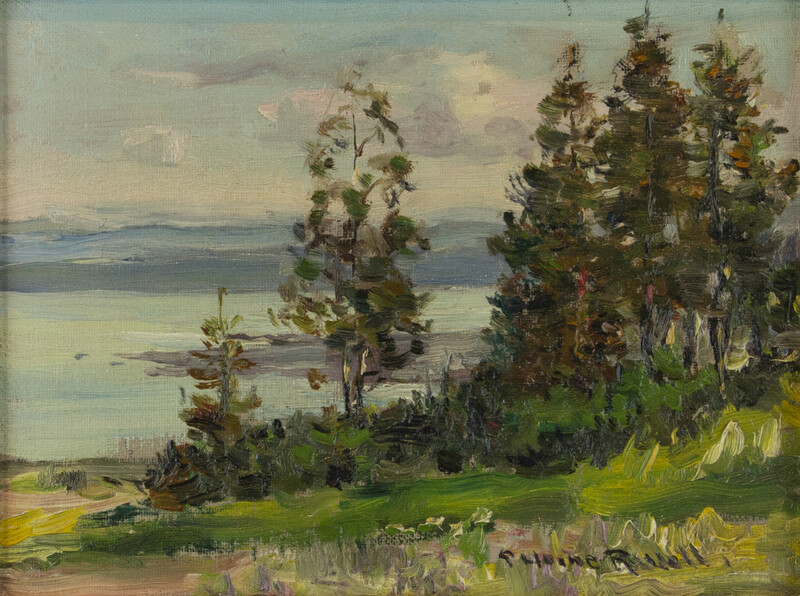 Lover of nature as he was, he could quietly indulge his fondness for painting pastoral scenes and seascapes without concern for a future buyer. An approach to landscape painting of this sincerity, motivated by some obscure inner necessity, could only result in work that had the glow of an inspired artist. The result was that such pictures found an appreciative and patronizing public awaiting them. Russell soon reached the position where he could enjoy the comforts of a country house at St. Andrews by the Sea, where, year after year, he spent the summer. Thus his life alternated delightfully between the painting of duck-ponds, fishing schooners, salty little harbors, ribbed sea-shores breaking waves, blue summer seas and, in the winter, the portraits that awaited him. Could an artist ask for more? Russell struck no profound chords, attempted no criticism of life, but painted his sitters in attitudes of their external best and seascapes that have the charm of poetry. This attitude could be quite expected from so rounded and well-balanced a personality as Russell possessed. His early Scottish training, his very blood, eschewed any departure from the sane and normal point of view. His portraits pleased his sitters, his landscapes and seascapes are undisturbing and pleasing to live with. Russell was a very successful artist. His academic confreres recognized his essential soundness, and in 1909 he was elected Associate of the Royal Canadian Academy and in 1919 to full Academician. In 1922, he became President of the R.C.A. He was in many ways admirably suited to this post; his dignified manners, his ability to say a few words extempore, and his long association and familiarity with the routine of the Academy made him an ideal president. In 1924, during the Wembley Exhibition (British Empire Exhibition) he crossed swords with Mr. Eric Brown of the National Gallery on the question of the selection of pictures (and other works) for that show. As President of the Academy, Russell considered that he was upholding the privilege and tradition of the R.C.A. in being the sole selective body for pictures sent for exhibition abroad. In this case, the trustees of the National Gallery, in conjunction with artists they selected, were to decide on the pictures to be sent to London. A vote taken at a general meeting of the academy almost unanimously supported the action of their executives. Russell, in his famous letter to the London Daily Telegraph wrote, "the question is of course, one of principal as to whether laymen or professional artists are the best judges." The result of the controversy had wide ramifications, and a considerable number of the academicians refused to send pictures at all. The smoke of this fire is still in some eyes, and the sort of schism created has not been wholly resolved. It is here mentioned as a matter of biographical record. Russell had no direct pupils, but his efforts to help and direct young artists were never failing, and he seldom missed a meeting of the Women's Art Society, giving constructive advice and all the help he could. He was a member of the Pen and Pencil Club of Montreal. Russell has a secure footing in the realm of Canadian Art. That he was our greatest marine painter may be readily conceded, and he was undoubtedly one of the best portraitists. He knew and painted some of the most distinguished men of his day, and many of these men will be remembered in their physical aspects by Russell's portrait of them. Some of his marines, painted with enjoyable gusto, touch the edge of greatness while his nocturnes are unique in their poetic imaginative quality. Time alone, which winnows without favor, will assign him his ultimate niche in our halls of fame. It is certain, however, that Russell greatly enriched the art of his adopted country, and brought to many homes some glamour of the sea, some aspect of our natural beauty that would otherwise have been missed. Russell had a quiet and pleasing personality and during his pilgrimage gathered many friends. He was a born "mixer," and could put a nervous sitter at ease with a few words. He never entirely lost his Scottish accent, and his richly rolled R's reminded one of homespun and heather. He was a friend of Sir William Van Horne and might have changed places with him as a great executive, as Van Horne might have been an artist. He was a "big" man, and one suspected his personality had hidden possibilities of achievement in almost any sphere. His reticence was that of a natural gentleman, with all that that proud and dying word connotes. Pictures by Russell are in the Toronto Art Gallery (now the Art Gallery of Ontario), Montreal Museum of Fine Arts and the National Gallery of Canada. After a brief illness, he died at St. Stephen, NB on June 24, 1933, and was buried in St. Andrews NB. He was survived by his widow, Miss Elizabeth Morrison;, one son, Norman Wells; and a daughter, Mrs. A. J. Mackenzie of Detroit, MI. Transcribed from a biographical sketch typed by William R. Watson, art dealer, who closed his Montreal art gallery, circa 1959. Please send me more details about the following artist. G. Horne Russell, R.C.A. signed "G. Horne Russell . " (recto, lower right).